The Art Lab, situated on the beautiful grounds of the Snug Harbor Cultural Center, is a sanctuary for artists of all ages. Every summer I teach young teens at the Art Lab's Summer Studio Program (SSSP). And from the 1997-2006 I rented an artist's studio in this very same building above the Art Lab. 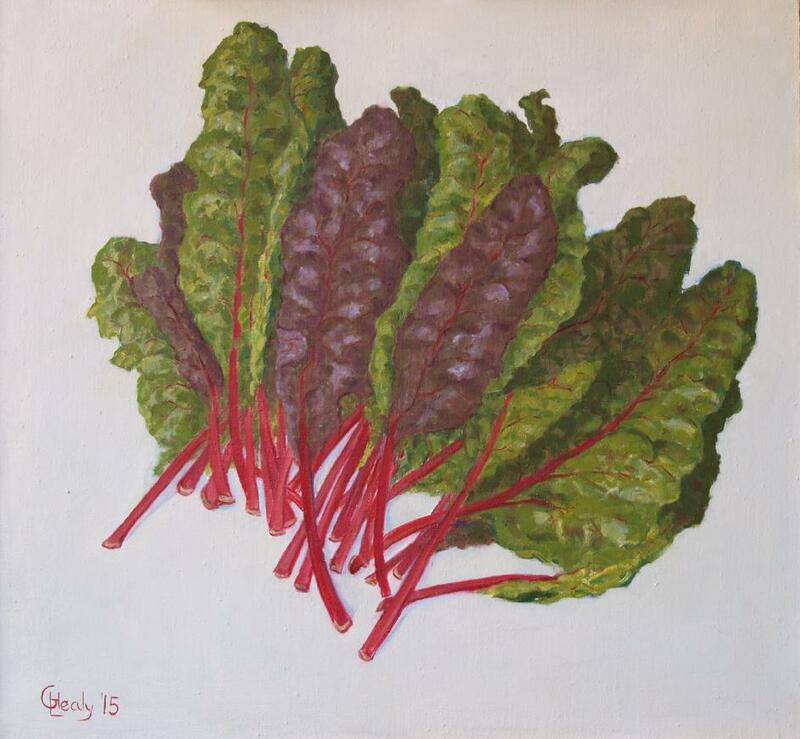 Red Swiss Chard oil on linen 20"x 30"
Figure and landscape painting are usually my primary concern. However, lately still life of beautiful garden vegetables seem to be taking the fore. As time passes I recall good times, and long hours with young children and great vegetable gardens. In the little village where I used to live a few decades ago, children and garden was all we talked about. Perhaps I miss an aspect of all that. And now, with the adjustment of apartment city living, no children, or garden to talk about or to paint as subject, I find myself seeking New York City green markets. These markets provide the public with a bounteous array of vegetable varieties. 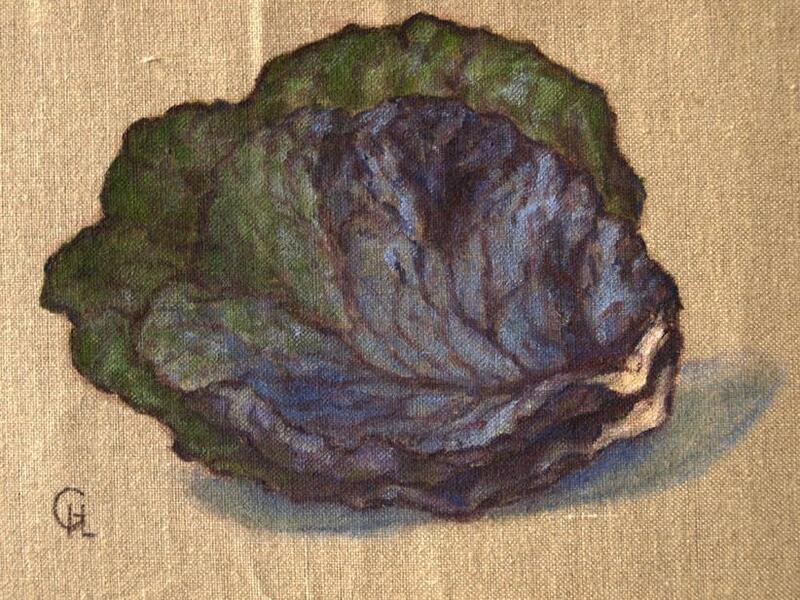 This exhibition presents you with a selection of paintings from my Chard and Kale Series. They are portraits per say and my concern is to portray and celebrate their lively character, rich color, and elegant design. 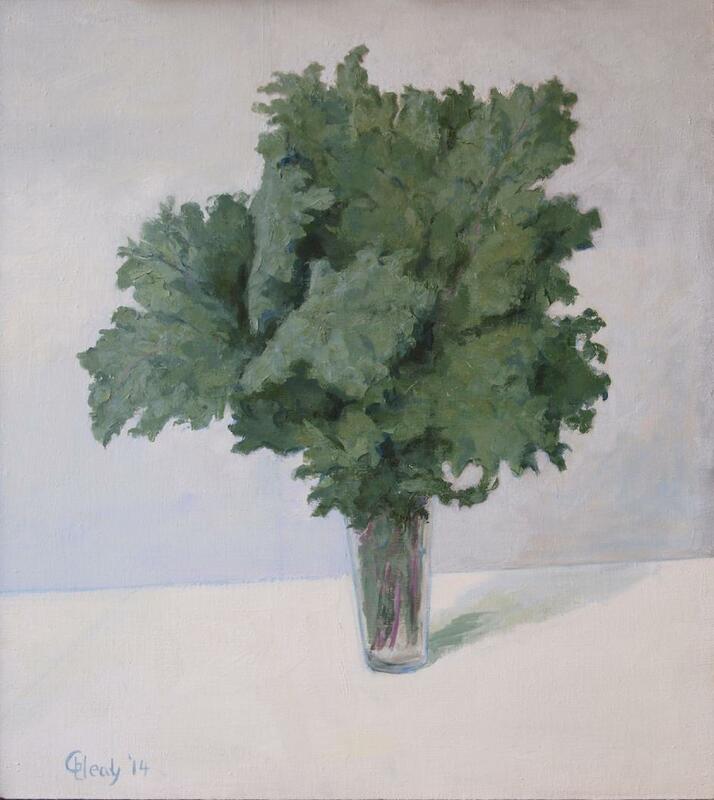 To view more paintings from this series visit my website link: Paintings/Chard and Kale 2015. 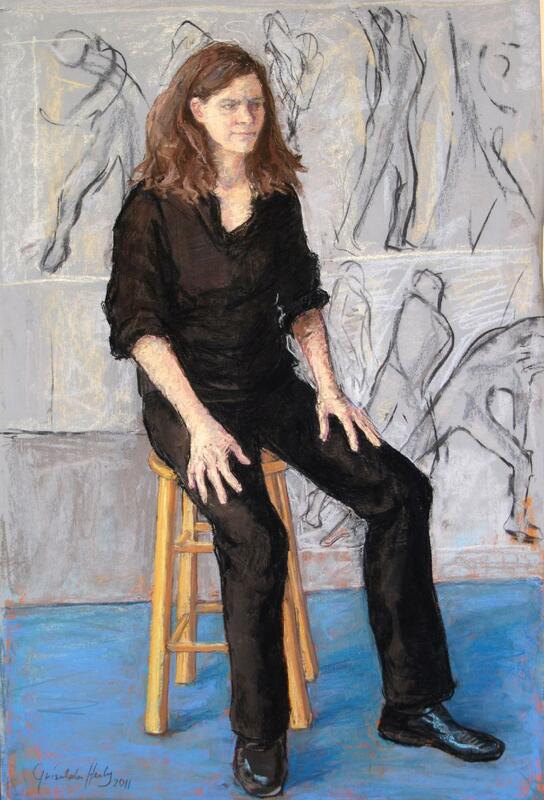 "Hester with Dancers" Pastel on board 30"x 20"
A pastel drawing “Hester with Dancers” will be on view at the Atlantic Gallery in Chelsea NYC. "Apples and Pears" was exhibited during the month of April, 2015; an invitational group exhibition celebrating the 40th anniversary of the Art Lab Gallery and school at Snug Harbor. This exhibition titled “Figure in Motion“has fiscal sponsored from the New York Foundation of the Arts (NYFA). It is an interdisciplinary investigation exploring ways to capture movement- spatial and temporal- and timed movement. The show consists of 13 large panel paintings presenting configurations of figure(s) in structured motion. The figures are set in context to New York City: specifically downtown Manhattan , with its monumental classical architecture, City Hall, the courts and the bridges, with references to nature, sky, and water- an environment which also displays movement and stillness. The figures in these works are drawn from dancers who modeled for many sessions in the artist’s studio. The dancers all work as a company with one of the founders of Dance New Amsterdam (DNA), choreographer Laurie De Vito. De Vito’s work has been the grounding source for this project. The dancers have come from all parts of the globe to dance in New York City. They meet weekly to rehearse at DNA Dance Studios on Chambers Street near the courts and City Hall. Performance is an important component for this project and exhibition, a premiere for this collaborative event. On October 13th during the opening day there will be two performances of “Struggle” by choreographer Laurie De Vito with a solo performance by Mika Yanagihara. The Wagner College Gallery is located in the Union building on the campus of Wagner College. Brooklyn based artists are opening their studios to the public. Visit www.gobrooklynart.org and find out how you can vote and participate in the open studio event and check out my open studio link for more information. New York Art Residency & Studios (NARS) Foundation is proud to present its annual Fall exhibition of thirty-five NARS studio artists. You are cordially invited to my open studio at the NARS Foundation Annual Open Studio event. Over 60 artists will be opening their doors. This Exhibition will feature works that are in process for a project titled "Figure and Motion". 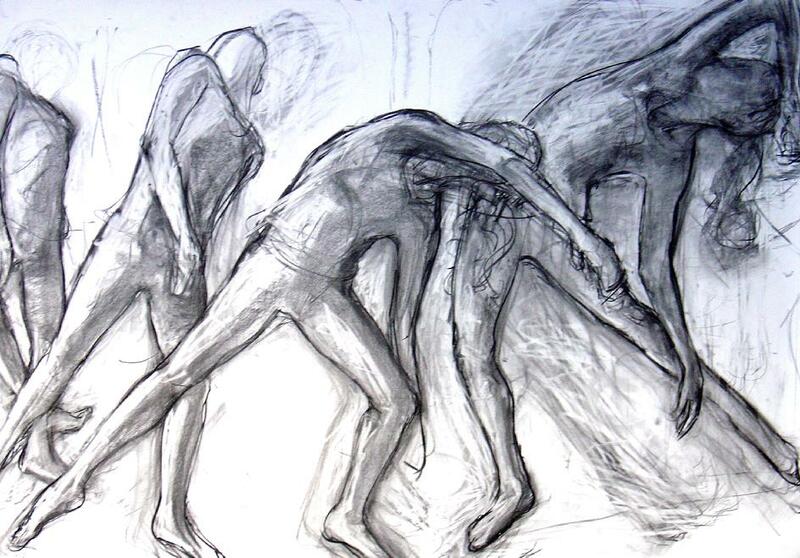 I am in the process of working up a series of figure movement sequences; working from life with dancers as models; beginning with drawings, and small oil sketches followed by larger movement sequences using graphite and charcoal materials on horizontal scroll lengths of paper. 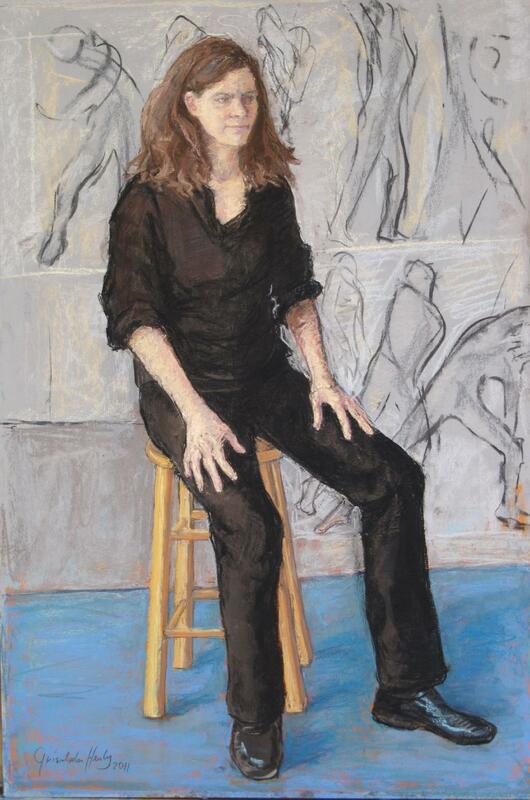 The figures in these works are drawn from dancers who model for me in my studio. They are a company of seven dancers and they work with one of the founders of Dance New Amsterdam (DNA), choreographer Laurie de Vito. 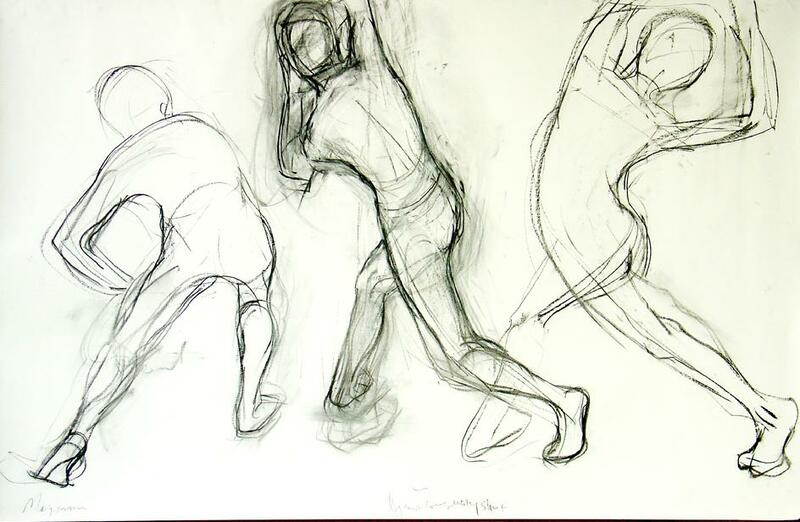 De Vito�s work and her dance company provide me with an array of visual figure motion possibilities that to my eye elegantly express the ideas I wish to convey; visual contemporary figure movement in the context of our time and place. For my figure configurations I choose specific sequences from De Vito�s work, movement and figure shapes that have been created and inspired by composers Philip Glass and Armand Armar. I would like to take this opportunity to thank the generous support of Laurie de Vito and her company of dancers: Kate Bailey, Sarah Clark, Rachel Feinerman, Sally Im, Megumi Onishi, Suzanne Reiman, Marcia Elizabeth Thompson, and the executive director of DNA Catherine Peila who made this show possible. This project �Figure in Motion� is supported by a fiscal sponsorship from the New York Foundation of the Arts. Presenting a vast range of work in all media by the descendants and extended family of the renowned architect Stanford White. White (1853-1906) is best known for designing architectural masterpieces such as the Washington Square Arch, the second Madison Square Garden, the New York Herald Building, gentlemen�s clubs, and the Boston Public Library. 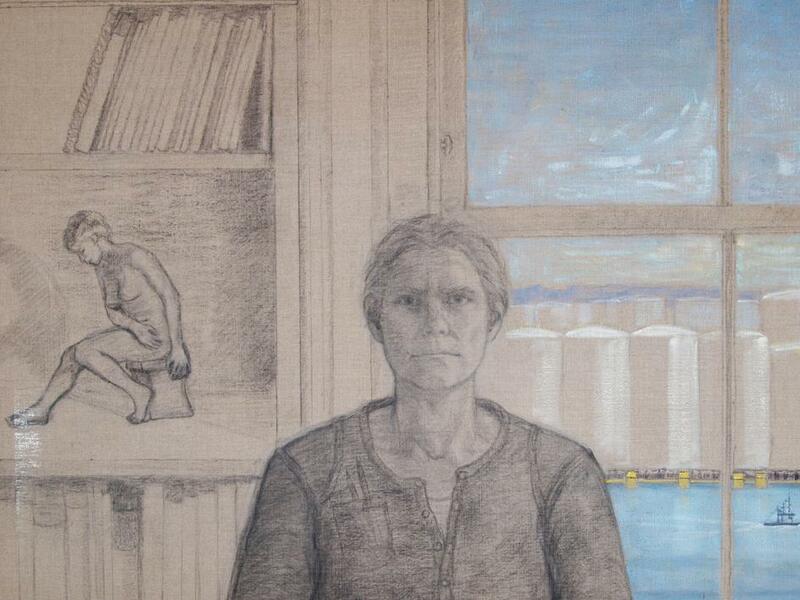 At the Bryant Library in Roslyn, the �show within a show� will feature portraits and figure works of painter Griselda Lessard Healy (great granddaughter of Stanford White), who maintains her studio in Brooklyn and is known for her painterly expressive Staten Island Ferry paintings and shore-front shipping themes, as well as her insightful portraits. The exhibition is organized by Franklin Hill Perrell, former Chief Curator of the Nassau County Museum of Art in Roslyn, in collaboration with family member and artist Cynthia Jay who is a periodic curator of exhibitions at the Hutchins Gallery of C.W. Post College, Long Island University, in Brookville. Perrell is on the board of Art League of Long Island, and is the Executive Director of the Roslyn Landmark Society. 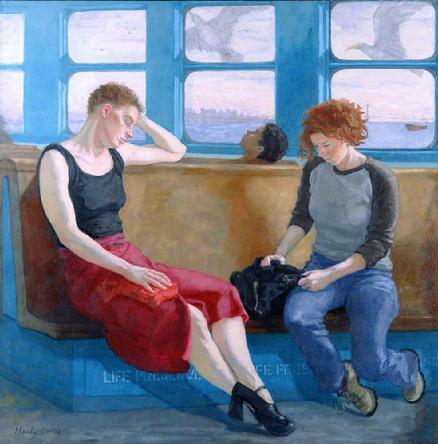 The Staten Island Ferry 27" x 27" 1997. These two works along with 43 other acquisitions have been selected from the Museum's permanent collection. I donated these paintings to the Museum after my solo exhibition Ferry, paintings and pastels. The exhibition was part of the Staten Island Ferry Centennial Celebration in 2005. 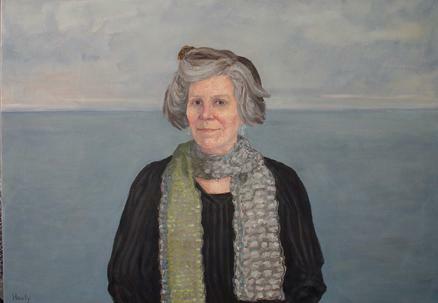 Griselda Healy is currently showing her recent Portrait of Pamila Hepburn at the Noble Maritime Collection museum. Ms. Hepburn captained tugboats in the New York Harbor for over 20 years and is now restoring her tug Pegasus. Pegasus will soon be the first traveling tugboat museum. 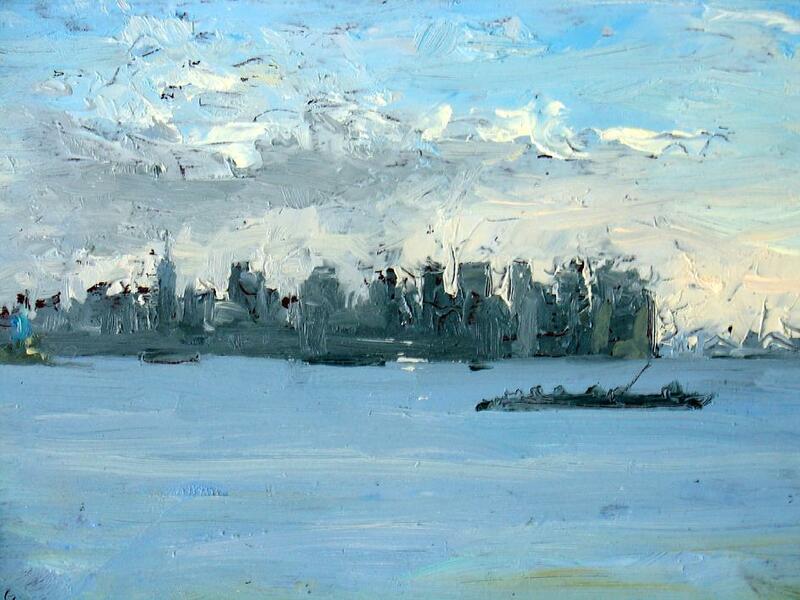 This exhibition also features a selection of Griselda's plein air New York Harbor tug paintings, a painting of the Pegasus restoration process, and the Philip Finney,"Tug at Rest". This tug was also captained by Pamela Hepburn and now lies abandonned on the Richmond Terrace shore of Staten Island.